Jeffrey J. Steffen is a member of the Firm's Business Transactions practice group. As a Partner of the Firm, Jeff focuses his practice in the areas of corporate and commercial law, landlord/tenant law, asset protection and business planning, real estate, and construction law. Jeff helps his clients negotiate and draft the full range of business contracts. His experience includes stock/asset purchase and sale agreements, licensing agreements, employment and independent contractor agreements, nondisclosure agreements, non-circumvention agreements, option agreements, franchise purchase and sale agreements, and settlement/release agreements. Additionally, Jeff has considerable experience in the drafting and negotiation of game development/intellectual property license agreements for not only land-based slot machines, but also online gaming. He advises clients regarding entity selection, formation, and governance, including operating agreements, bylaws, and corporate resolutions. He also has experience with negotiation and preparation of mergers and acquisitions. Jeff represents buyers and sellers in commercial real estate and development projects and has experience closing multi-million dollar deals. His role includes negotiating and drafting purchase and sale agreements, reviewing title and survey documents, and drafting and negotiating loan documents. In addition, he helps his landlord and tenant clients negotiate and draft residential and commercial leases, including gross, NNN, percentage rent, and ground leases. Further, he has experience in assisting clients with various other activities, including evictions, unlawful detainers, foreclosures, and short sales. For his construction clients, Jeff assists with negotiating and drafting contracts on behalf of owners/developers, contractors, and subcontractors. He has experience with custom documents, AIA documents, and ConsensusDOCS, as well as related items. Originally from Chicago, Illinois, Jeff received his B.A. from Northern Illinois University, and his J.D. from The John Marshall Law School - Chicago. He practiced law in Chicago for three years before moving to Las Vegas, Nevada. 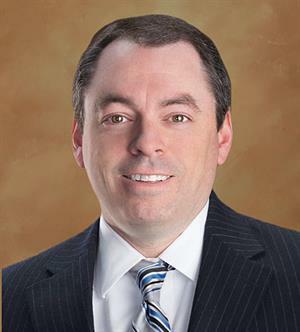 Prior to joining Hutchison & Steffen, Jeff spent several years at two prominent regional firms, where his practice focused on real estate and corporate transactions. Jeff also spent time acting as General Counsel for a local private corporation. In his free time, Jeff enjoys playing and watching sports, spending time with his dogs, hiking, and amateur photography. Jeff also enjoys his time spent as a volunteer with Golden Retriever Rescue of Southern Nevada. Represented slot machine game developer in the acquisition of intellectual property licenses for the development of themed slot machines, including but not limited to a well-known science fiction brand, several hit television shows, successful poker players, and popular musicians. Represented a major casino and condominium management and resort development company in negotiating a series of management and other agreements with the owner of a $3.5 billion resort in the Bahamas which contains boutique and luxury star branded hotel and residential components. Represented a major casino company in restructuring $350 million in debt instruments. Represented the owner/developer in the preparation and negotiation of a general contractor's agreement for the development and construction of a luxury condominium project containing approximately 113 residential condominium units. Participated in the acquisition and financing of a low-income housing project in Southern Nevada. Represented a developer of a 29-acre mixed-use community which includes high-rise time share/hotel, condominiums, and retail components. Negotiated, drafted and closed asset purchase agreement involving multi-million dollar communication services company. Represented client in multiple acquisitions of car dealerships. Represented lender in connection with a $35M loan used for the acquisition of a hotel and casino. Represented seller in an $85M asset sale, consisting primarily of intellectual property assets.